The episode had not yet aired at the time of recording, causing some confusion at the start of the commentary. Wernstrom was intended to be a one time character, but was too good to leave out. Robot 1-X's design is based on an iMac. Satellite technology and the speed of light. Bender falling over in the trash can. 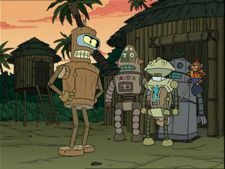 Bender is the only major character in act 2. There had been a scene with a rock that was in reference to Tom Hanks' volleyball in Cast Away. Maurice had recently acted in some anti-smoking ads for radio. Bender's line the the pig "now turn around" was contributed by Matt. Sinclair 2K is based on the Timex Sinclair computer from the 1970s, which had 2KB of memory. His design is based on Robby the Robot from Forbidden Planet. They didn't think Lisa would be easy to animate. The Lisa was predecessor to the Macintosh. John (as Bender) hummed along to his memory of the music for the recording. When they added the music later in matched up correctly. Dan did the initial design of wooden Bender. A slight change was made to remove the steam engine that was on his back. The music during the robots' attack on modern technology is by Christopher Tyng, not something that was licensed. There had been brief moments showing what each of the characters had been doing when the power went out; Amy had been on a treadmill and fell off onto Scruffy's lap. The sound of Bender's arms falling off had been temporary, but the good sounds weren't funny. They were concerned because both this episode and "The Sting" both feature long plots that aren't really happening. Dan Vebber: It was named after Steve Jobs' daughter, right? David X. Cohen: Sure, why not? Billy West: He should have named it after his son, Shemp. Dan Vebber: His son, Computer. Dan Vebber: This was... You actually drew this in the storyboards, didn't you? The way that he walks on his eyeballs? David? David X. Cohen: Me. That's all... That's pure Cohen. [pause] I didn't draw it, but I thunk of it. Some of the deleted scenes mentioned are on the disc, including scenes at the convention and in the upgrade facility. This page was last edited on 8 June 2011, at 06:21.